Winter is coming to an end, and spring is coming big on March 11, to the Whittier Narrows Recreation Area with the Festival of Colors. What better way to ring in spring than by covering L.A.’s skies with the color powders that you love , dancing your butts off and having fun with your friends. 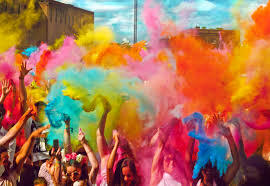 L.A.’s Festival of Colors brings the traditional Indian customs during which crowd throw colorful powder on each others as a we all welcome spring and saying good-bye to the cold. There will also performances by world-music stars. Expect to lose your mind along with thousands of people who happen to have protective eye gear and a knack for throwing powder in the air—although having for what will seem endless stains on your clothes, you can tell that it will be a blast to attend. Let your true colors show, let your party animal go nuts.